Situated just a stone’s throw from the popular beachfront, and town centre, 61 South Beach is a stunning sandstone villa comprising of excellent family sized accommodation over three levels. The property boasts a flexible layout with 4/5 bedrooms, each with en suite facilities, formal lounge, sitting room, dining kitchen and family bathroom. Externally the property comes with off street parking, large rear garden with patio area, and triple garage cleverly converted to create a further entertaining area. 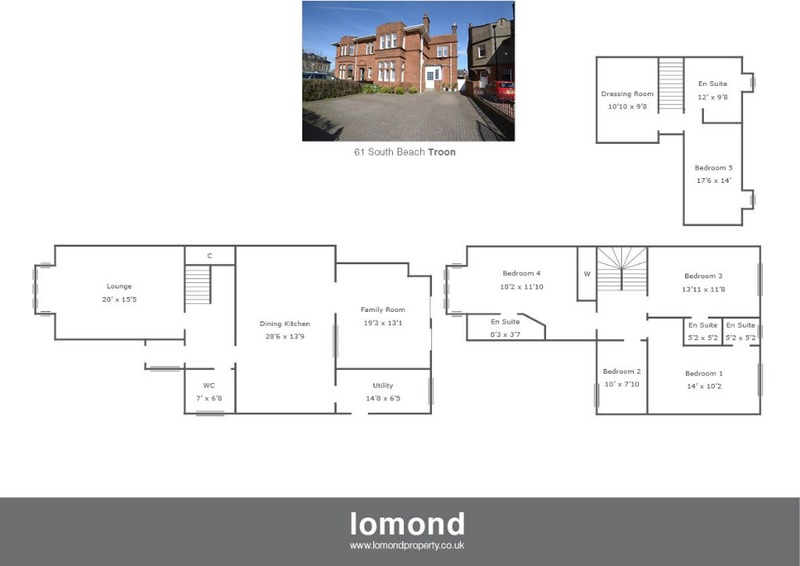 In summary the property layout extends to an entrance vestibule leading to the spacious and welcoming hallway with stairs off to the upper levels, and under floor heating.The ground floor living space comprises a formal lounge, with stylish décor and boxed bay window. To the rear of the property the living space continues with a stunning dining kitchen with centre island display and utility room off. The sitting room is open plan to the kitchen area and in turn allows access via French doors to the patio and rear garden. A WC completes the ground floor. The first floor houses four bedrooms, three of which come with en suite facilities. The upper level comprises a further double bedroom, again with a en suite bathroom, and a large walk in dressing room/office. Externally the property has grounds to both the front and rear. To the front mono bloc paving forms off street parking for 3-4 cars. To the rear the garden is laid predominantly to lawn with patio area ideal for summer dining. 2/3 of the triple garage has been converted to create a games room complete with bar and heating. South Beach is an established residential area. The world famous Royal Troon Golf Club is just a short walk. Troon town is close by and provides access to a range of amenities including supermarkets, bars, restaurants and town centre shopping. The train station is just a ¼ mile away providing regular services to both Ayr and Glasgow.There are a number of local primary and secondary schools within the greater Troon area.